Some of us wait until it’s time for a warrant of fitness to address underbody concerns, while others may write off poor driving characteristics as exactly that — character attributes of a vehicle from a bygone era. But an older vehicle doesn’t necessarily have to drive like one, and knowing what is going on underneath is the first step towards knowing how to ensure the best possible driving characteristics. Following the old adage that if it sounds too good to be true, it probably is, comes the news that regular, proper care and maintenance is what really keeps our classic cars on the road. Regularly scheduled maintenance and lubrication will generally do the trick, and replacing the necessary parts before they wear out or fail is definitely a good strategy for keeping your car in tip-top road-going condition. After all, taking good care of your vehicle can make the difference between being the proud owner of a fine-looking good-handling reliable classic, and saying goodbye to an old jalopy that was reasonably presentable, but terrible to drive, and which fell apart long before it was designed to. With this in mind, and following our Coachbuilding Masters feature in last month’s issue, this issue we talk to a wide range of experts who are in the business of keeping us safe on the road. From tie-rod ends to ball joints, coil springs to leaf springs, steering to wheel alignment, these are just a few of the ‘underbody’ areas we look at in this issue, and the good news is, expert advice is never too far away. A vehicle’s suspension and steering systems are invariably linked, and comprise the most important aspects of a vehicle’s safe driving characteristics. They are also, therefore, the areas where the smallest of changes can yield the most significant improvements. Shaun from Muscle Car Parts tells us that on a basic level, a vehicle’s suspension is tasked with taking out the bumps on the road and generating a smoother, better controlled ride. Since the ground is almost never even when you drive, there needs to be some compensation for this. “You really need to do your homework when it comes to suspension components. It’s so easy to get it wrong in terms of what will actually fit your car, especially in the classics — the components are often hard to source or not a mass-produced part — or even when changing from OEM specifications to generate a smoother or harsher ride depending on the application,” explains Shaun. “Shocks, springs, sway bars, and even bushes all come in a variety of specifications which may be right for one vehicle but completely wrong for another, even when similar in design. You need to ensure you are getting the right part for the right application. When considering the suspension system of a car, it helps to imagine a car sitting on no springs, which will pretty much have the chassis lying on the ground. Now imagine the same car on a hoist, where the wheels will be hanging well below the chassis. The purpose of the suspension system is to suspend the vehicle in equilibrium in such a way that all of the vehicle’s wheels will have sufficient upward or downward travel — without ever reaching the extremes mentioned earlier — to retain contact with a variable road surface. 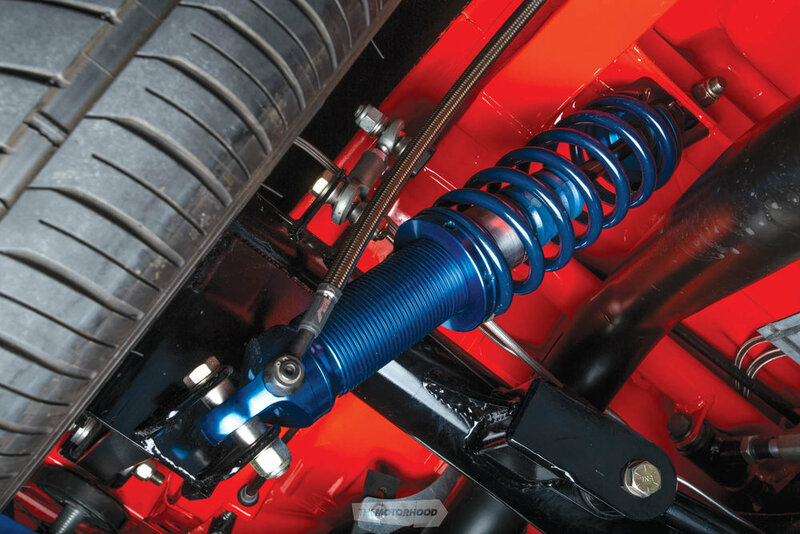 Springs are one of the major parts of any vehicle’s suspension system. A mental image of a coil spring is probably the first thing that crosses most minds when talking about vehicle suspension, or leaves, if you’re more akin to dealing in the classic vein. Automotive springs are most commonly identified as coils, leaves, or torsion bars, although airbags and hydraulic rams can also technically be counted as spring equivalents. Chris Alexander from Suspension Tech explains that the most common reason a spring is changed is to alter the ride height, and this is where the car’s handling characteristics can also be tweaked by way of spring rates. Once you get select your ride height, then you can get the dampening right through the selection of shock absorbers. It’s important to consider this when selecting the spring rate — you can over-spring and under-absorb a system; the idea is to get them working in unison. Coil springs are commonly compared in terms of spring rate, which is a measurement of the weight required to compress a spring by one inch. A spring with a rate of 200lb/inch will compress by one inch for every 200lb load placed on it. A spring with an 18kg/cm rate will compress by one centimetre for every 18kg of load. You may also note that many coil springs can be had with either a linear or progressive rate. What does this mean? Linear rate springs compress at the same spring rate, regardless of compression or load on the spring. In comparison, the spring rate of progressive rate springs increases the more they are loaded or compressed. The purpose of a progressive spring rate is essentially to eke the best of both worlds from the spring — a softer spring rate for minor irregularities in the road surface, with a progressively increasing spring rate to limit body roll as the car is driven harder. Leaf springs operate on a rudimentary design, generally based on multiple ‘leaves’ — primarily a semi-elliptical sheet of steel — stacked on top of each other, getting progressively shorter in length. The ‘top’ leaf is the longest, meaning it will have the most flex in it. As the load increases and the top leaf straightens out, it meets resistance from the shorter leaf below it — this continues, with each leaf adding an extra, and increased, degree of resistance. Torsion bar suspension was an extremely popular system across the world, although most people will associate them primarily with Chrysler vehicles manufactured around the 1950/’60s. The torsion bar acts as the spring in such a system. It is a metal rod or bar, firmly affixed to a chassis mounting point, with the other end fixed to a pivoting ‘lever’, primarily the lower control arm. As the control arm moves up and down over road undulations, it twists the torsion bar, the resistance of which acts in the same way a spring regulates bumps. One of the biggest advantages of torsion bar suspension is its ease of use as far as adjustment and maintenance is concerned. Ride height, and the associated suspension properties, can be altered simply by turning each side’s torsion bar adjuster bolt. The ‘spring rate’ can also be changed simply by swapping to a different rate torsion bar, rather than removing and replacing coil springs. The shock absorbers main function is to control the vehicle’s springs and maintain tyre contact with the road when the vehicle hits a bump and the spring is compressed. This compression creates kinetic energy, and the kinetic energy is released when the spring extends. If there were no shock absorbers, there would be nothing to control this release of kinetic energy, and the vehicle would bounce down the street uncontrollably. It is perfectly explained by Newton’s third law of physics: for every action, there is an equal and opposite reaction. A shock absorber controls this release of energy by exploiting some simple hydraulic principles. All hydraulic shock absorbers operate on the principle of converting kinetic energy into thermal (heat) energy, and then dissipating that heat to the atmosphere. They do this by forcing the oil inside the shock absorber to flow through restrictive orifices and multi-stage valves to generate hydraulic resistance. Shocks with adjustable valving offer users the ability to fine-tune each shock absorbers damping to suit particular preferences. The sway bar, or anti-roll bar, is designed to counteract body roll by anchoring the vehicle’s left and right suspension to fixed points on the chassis both in the front, and in the rear. Imagining a typical vehicle with independent front suspension, and a live rear axle, the front sway bar would attach to the lower control arms and be mounted on the chassis, while the rear end would be fixed to the diff housing and is attached to the chassis. The resistance to body roll is affected by the torsional stiffness of the sway bar, which is usually determined by diameter or whether it is of a solid or hollow construction. Evan Pittman from Speed Factor tells us that fitting a sway bar to an older vehicle that does not have one is typically the most substantial change you’ll see to a suspension system, particularly in one that has a lot of travel. When cornering, as the body begins to roll, differences between the suspension load of the inner and outer wheel cause the sway bar to twist — its resistance to twisting is what determines how much or little the body roll is reduced. A sway bar of a larger diameter, or solid construction, will generally have a greater torsional stiffness than a smaller diameter sway bar or one of hollow construction. Evan also notes that having a worn sway bar link will reduce the effectiveness of what the bar is trying to load into the strut/lower control arm, particularly in the front, and can cause a delayed reaction to input. Replacing worn examples with new, or even adjustable options, will make for a better result. Suspension bushes act as a sort of cushion between moving suspension parts to prevent metal-on-metal contact. This also helps to dampen any vibration and noise transmitted through the suspension system, while retaining the vehicle’s suspension geometry. Construction is generally of a flexible material — primarily rubber or polyurethane — moulded into a tubular form sometimes with an internal ‘crush tube’ to house the fixed pivot point. Paul Walbran at Paul Walbran Motors explains that suspension bushes provide a double means of locating suspension components while insulating vibration to reduce sound omitted. 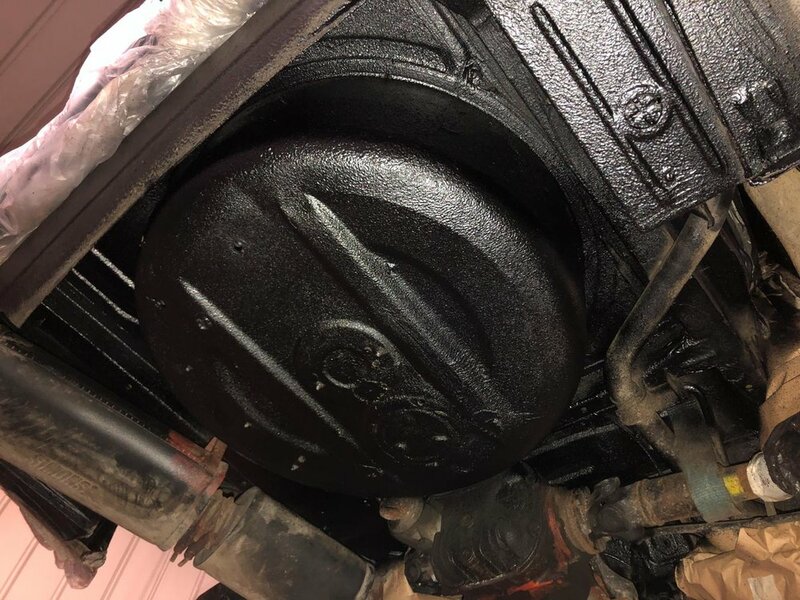 Paul mentions that there are many types of bushes, the most common being rubber, but where a rubber option is not available for older classics due to scarcity of parts, polyurethane bushes can be used as the material is machineable, whereas rubber is not. These are generally better at locating, too; however, there is a small trade-off, being slightly harsher in most applications. Polyurethane bushes are firmer than rubber bushes, and this inherent rigidity and resistance to impact and abrasion make urethane bushes suited for applications where the suspension components are under increased pressure, but may be susceptible to a shorter service life. Solid suspension bushes — in the form of Heim joints, Johnny joints, or rose joints — are, technically, the most effective means of avoiding bushing deflection. Their solid construction transmits far more shock and noise than flexible bushes, and requires periodic lubrication, but the virtual lack of deflection can make them a feasible bushing option in race-only vehicles. As covered earlier, a vehicle’s steering and suspension systems are equally important, not only from a road safety perspective, but also for driving dynamics. Boiled down to its simplest form, the principle of steering is a remarkably easy one to grasp — you turn the steering wheel, and the wheels turn in the same direction. Look a little further, though, and you will find that what happens between the steering wheel and the tyres can be somewhat less straightforward, as it needs to transform the rotational movement of the steering wheel into linear movement of the steering assembly. But at least the system will be easy to identify — it is likely to be either a steering box or a rack-and-pinion assembly. According to Phil Game from PG Hydraulics, the first thing to remember is that regardless of a car’s age, the two most critical safety aspects are steering, followed by brakes. If you’re going make a significant investment in restoring your dream classic car, then you’d be a fool not to ensure that the steering is in perfect condition. If you’re looking to buy a classic car, then it’s usually the general condition and milage that will give you a reasonable indication of the condition of the steering gear, as well as any other mechanical components in the car. Steering box mechanisms are almost certain to operate on the recirculating-ball system, popular with older and commercial vehicles. The steering box is rigidly mounted to the chassis, and contains a worm-and-sector gear that is driven by the steering shaft, with recirculating ball bearings in place to reduce wear and play. As the worm shaft rotates, it turns the sector gear, which turns the Pitman arm in a linear left or right direction. A series of linkages — comprising the drag link, idler arm, tie rods, and steering knuckles — ensures this movement is transferred to each road wheel. Rack and pinion steering is the de facto system for modern vehicles, but has been in use for many decades. Its popularity is surely a direct result of its simplicity, which translates to cost-efficiency in a mass-produced scale. The steering rack comprises a toothed shaft within a tube, rigidly mounted to the chassis in a lateral (left–right) direction. A pinion gear, driven by the steering shaft, engages the rack, sliding it in a linear direction. As the rack ends are attached to tie rods, which are connected to the steering knuckles, any linear movement of the rack translates directly to steering. The large variety of OEM-produced rack assemblies and their reputation for direct steering feedback makes conversions to rack-and-pinion steering an increasingly popular conversion in the classic car sphere. Power-assist is perhaps the biggest change that can be made to improve a vehicle’s drivability, short of the requisite wheel alignment (which should go without saying). Many classic vehicles never came with power-assisted steering as stock, but modern technology means they needn’t be cumbersome to drive. Hydraulic power steering is a common method, utilizing hydraulic pressure from a belt-driven or electric pump to assist the mechanical inputs through steering wheel rotation. However, the addition of hydraulic power steering requires not only a hydraulic pump, but a suitable rack or steering box. If your vehicle was never offered with power-assisted steering, or you can’t find suitable conversion parts, electric power steering (EPS) may be a viable alternative. Though given a bad rap in modern vehicles equipped with it from factory, EPS can be an option to lighten a classic vehicle’s steering. An EPS unit designed to work as a steering shaft intermediary may be retrofitted, but will require electronic inputs that could require the installation of additional sensors — a potential wiring nightmare! However, there do exist aftermarket kits that take the guesswork out, making the electronic route one worth considering. The inherent interlinking between a vehicle’s steering and suspension systems means that altering the geometry of one has a direct effect on the geometry of another. Malcolm Clark from Bygone Auto Services explains that the most common alteration that will affect a car’s geometry is lowering, and that is going to change the alignment figures. These will need to be adjusted to suit the purpose, generally to the original specifications for a road car. Incorrectly aligned geometry will cause the car to feel nervous, especially on undulating surfaces such as country roads, ducking and diving all over the road. Camber angle refers to the inboard or outboard tilt of the top of the tyres when viewed directly from the front or rear of the vehicle. Negative camber is when the top of the tyre is tilted inboard (towards the centre line of the vehicle), while positive camber is when the top of the tyre is tilted outboard (away from the centre line of the vehicle). Camber angle is adjusted to maintain an even tyre contact patch while cornering. A small degree of negative camber is generally beneficial in this regard, as it may help neutralize the loaded outside wheel’s natural tendency towards positive camber when cornering. Toe angle refers to the measurement between the front wheels relative to each other, when viewed from directly above. Toe in (positive toe) is when the wheels are pointed slightly inwards, with the front of the wheels closer together than the rear. Toe out (negative toe) is the opposite, with the front of the wheels farther apart than the rear. Toe angle can have a big impact on tyre wear, and plays a large part in determining a vehicle’s handling characteristics. Because of how varied the effects of toe angle are on the handling characteristics of different vehicles, there is no cut-and-dry rule about what is optimal — fine-tuning through trial and error is the safest option. Caster angle represents the difference between the steering axis and vertical when viewed side on. The steering axis is an imaginary line intersecting the upper and lower ball joints on vehicles with double-wishbone front suspension, or between the upper strut bearing and the lower ball joint on MacPherson strut–equipped vehicles. Caster provides directional stability, and most vehicles tend towards positive caster, which provides good steering feedback and self-centering steering force. Ackerman angle refers to toe out while a vehicle is turning. As a vehicle turns, the inside wheel needs a little bit more turn angle than the outside wheel — just a small amount. If a car had zero Ackerman, both wheels would be turned at the same angle, which can induce understeer, provide unresponsive steering feedback, and increase tyre wear. The entire basis of any form of braking system is the principle of friction. Generally speaking, the more friction that can be applied, the greater the braking force. The vehicle’s braking system multiplies — either mechanically or hydraulically — whatever force is applied to the brake pedal, converting it into friction at the brake itself. However, one of the byproducts of friction is heat, which has potential to reduce braking efficiency. So, a braking system not only needs to be able to create friction for sustained periods of time, but, in order to continue to do so, its components must be resistant to heat. And in terms of a classic, ensuring that your braking system is not only functioning, but adequate for its intended purpose, should be high on the list. Mechanical brakes transmit force from the pedal to each brake through solely mechanical means, usually cables. The taut brake cables act as a direct conduit between the pedal and the brake shoe — depression of the brake pedal will proportionately pull the brake shoe against the drum, creating friction to slow the vehicle. The principle of mechanical brakes on automobiles has been eked out of production, due to the technical superiority of the hydraulic system. Hydraulic brakes operate on the same fundamental principle, albeit with hydraulic fluid as the conduit. The incompressible fluid is effectively a solid medium, relaying any force from the pedal assembly to actuate the friction material. A brake master cylinder uses a piston to displace hydraulic fluid, stored in its reservoir, through the hydraulic brake system. The piston is actuated by a pushrod attached to the brake pedal, operating on the principle of fluid displacement to achieve a balance of volume and pressure. Drum brakes operate on a simple principle. The brake drum mounts to the hub, behind which the shoes are mounted to a fixed backing plate. Braking force, applied either mechanically or hydraulically, pushes the shoes outward against the inner drum surface, generating frictional force required to slow the vehicle. The mainstream development of self-energizing brakes in the 1930s — which used the rotational force of the drum to increase braking force — made drum brakes far more efficient, but they are now viewed as an antiquated braking system. As cars became more powerful, and vehicle safety of increasing concern, the hydraulic disc brake delivered the improved braking performance that the drum brake could not. However, when properly set up and maintained, the drum brake will admirably perform its job as it was designed to. Disc brakes typically operate on a very simple principle. The brake disc is directly connected to the wheels, while the caliper is fixed in position — usually on a strut, steering knuckle, or backing plate. The caliper holds a pair of brake pads, designed to be the conduit between the hydraulic braking system and the brake disc. As brake pressure is applied, the caliper piston forces the brake pad against the brake disc, creating friction. As more braking pressure is applied, the brake pad applies more pressure to the disc, increasing friction and slowing the rate of speed, causing the vehicle to decelerate. When it comes to protecting the underside of your classic car, the old adage ‘prevention is better than cure’ definitely applies. We all want to preserve our cars and reduce the need for costly future repairs caused by rust; therefore good chassis/underbody rust protection is undoubtedly a must have, especially if you are using your car all year round. With this in mind, the most logical and practical way of protecting steel-bodied vehicles is to shield it from both oxygen and water with a form of underseal. As the underside of a car is vulnerable to being pelted with everything from gravel and water to stone and grit, a good quality flexible rubber, or bitumen-based, underseal might be applied to protect it. Bevin Bradley from Wyatt Machine Tools tells us that these are the two main types of compounds used to protect the underbody from damage. 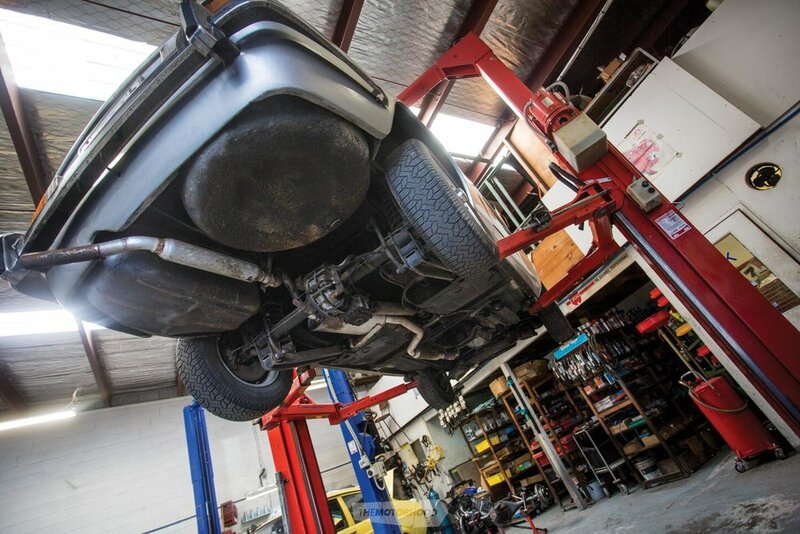 It’s important to note that the underbody isn’t the only area that needs rust protection. The seams, box sections and wheel wells are also vulnerable to the onset of corrosion particularly in the winter months when many of our roads are gritted. As an added precaution, a thin, protective wax or oil, can be sprayed into these hollow sections, to prevent the moisture from making contact with the metal.